How can virtual servers and their hosted applications be made available to cloud consumers? Cloud consumers need to be able to access virtual servers and their hosted applications and services. The virtual servers are connected to a virtual switch that has at least one physical uplink that is accessible to cloud consumers. The virtual switch and its physical uplink are used in combination with various networking components to make the virtual servers and their cloud services available to cloud consumers. 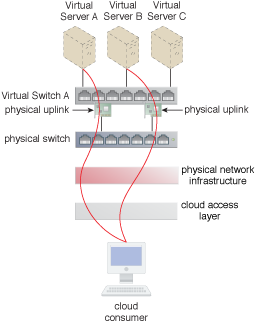 Cloud consumers can communicate with the virtual servers after the virtual switch’s physical uplinks have been implemented.